Go to any EXP bank sign, see your own stats, and deposit or withdraw EXP. 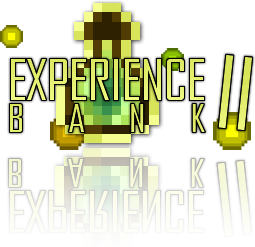 Just one EXP bank can manage the EXP of the whole server. - You can walk up to any EXP Bank sign and see your OWN stats! ~ Storage is used to set exp bank storage limits for different users. To add a new limit, simply create a new key under storage. e.g. "donator"
Please PM me if you need some help in creating a standalone plugin with similar mechanics. - Add a command to see a table of how much EXP is in each level. Kind of looks like the plugin is abandoned now. But I have the same issue as you do brunokcampos, the xp limit is not configurable. I created alternate permission nodes and defined the limit under storage but on a server restart or even if a player uses the sign it deletes the storage settings leaving only the default. If you find a fix I would be very interested. Will this plugin work in 1.9.2? and when i create a sign, my name stay when another player use the sign, It's always my name and account is displayed but it work. Hi, thanks for the great Plugin. But I've one problem. The config file changed to default if I restart the server. I don't have time right now to update this. Hi Empire, is this open source? More importantly, I can't get this to work correctly on Spigot 1.8.8. By default, the limit is set to 825 and it only accepts 6 levels of XP. How do I get it to take all the levels the player has? For example I'm at 46 and after hitting the sign I'm down to 40. The plugin, every time it's hit, takes approximately 150 XP, which I need to lower significantly... how do I accomplish this? Interested in different signs like [EXP2] Would create a different configurable sign? With other placeholders? The retrieved experience was sometimes higher, not lower, something was definetly wrong. I'ts been a longa time since I last used your plugin, I'm sorry that I cannot give further details, but I may give it a try again when I can, I report in detail again. I did use MySQL, everything was well configured. Experience is not retrieved correctly when inserted into bottles. Stored experience sometimes dissapears after a server restart. That is not the only issue the plugin has. Did you read the bug report? I just updated the plugin. It now has an optional ProtocolLib hook which should fix the debug messages showing up for clients. It's basically broken in Spigot 1.8 An update is necesary.